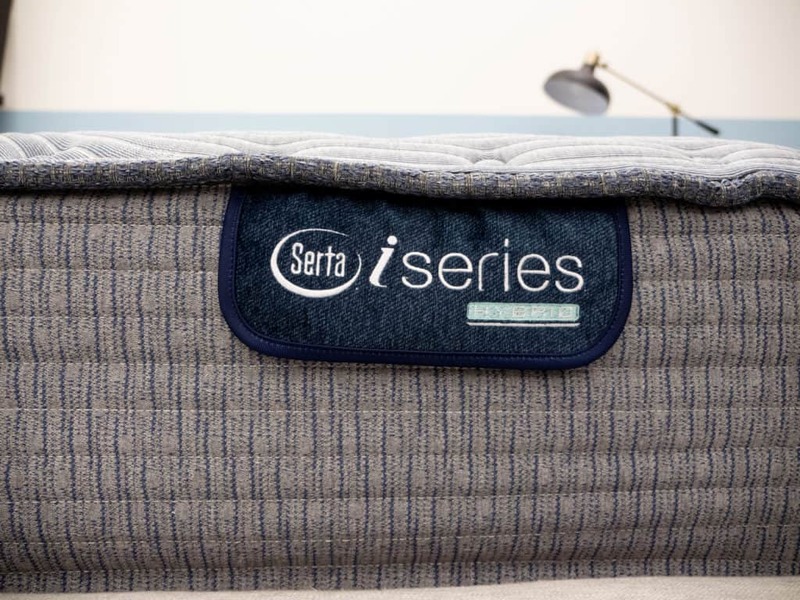 Serta Mattress Review - Is The iComfort Hybrid 300 Or 500 For You? 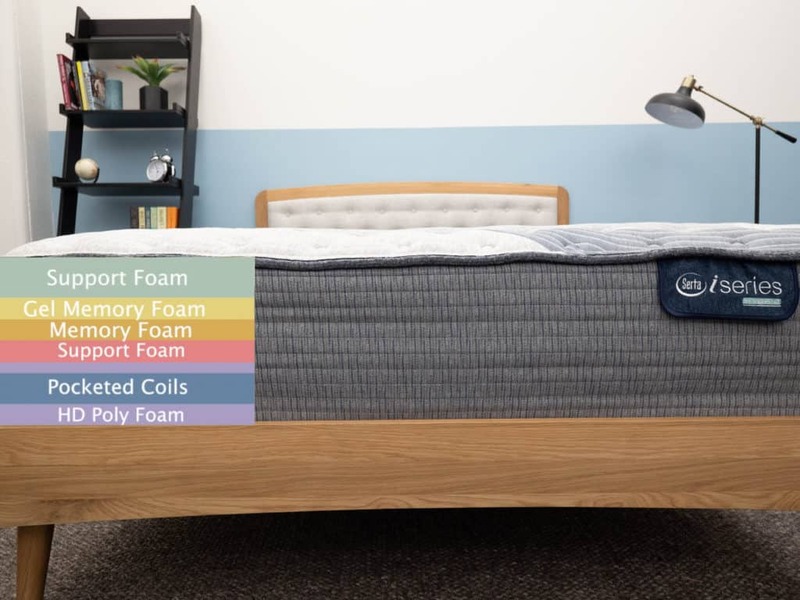 For this review, I’ll continue my exploration of the iComfort line of mattresses, a vast collection of different memory foam and hybrids beds sold by the industry vet Serta Simmons. I’ll be focusing on two of the hybrid models for this assessment: the iComfort Hybrid Blue Fusion 300 Pillow Top and 500 Extra Firm. 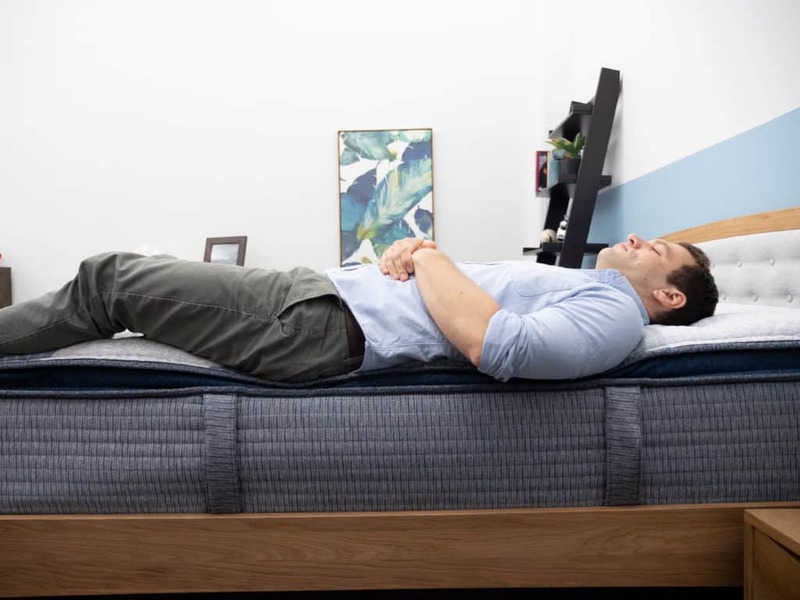 Though these mattresses might be powered by one of the most popular brands on the market, I won’t know how comfortable they actually are until I put them to the test to figure out how they feel, how they sleep, and whether or not one of them could be the bed of your dreams. Continue reading below for my full review of the iComfort Hybrid mattresses. Don’t have time to read it all? Click here to skip to the bottom and check out my review summary. 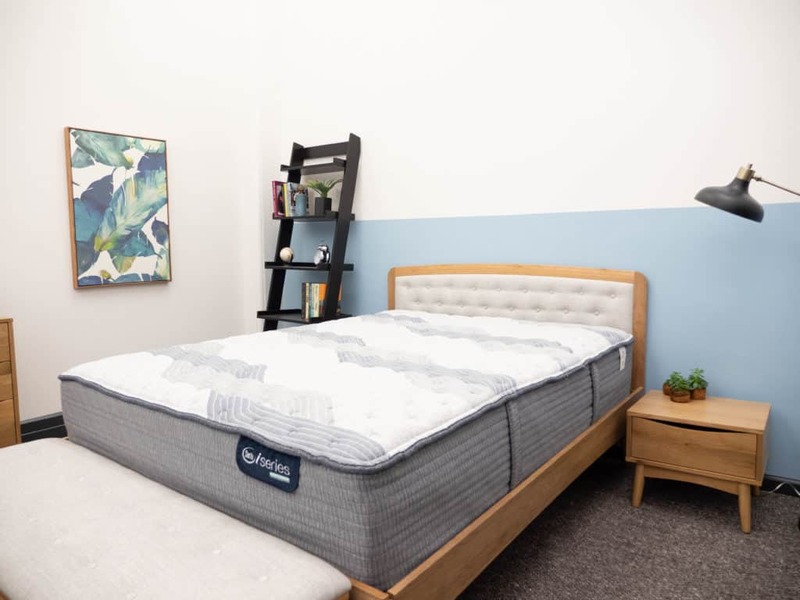 While both of these Blue Fusion beds are outfitted with hybrid designs featuring layers of soft foam over tall sections of pocketed coils, their feels differ significantly. 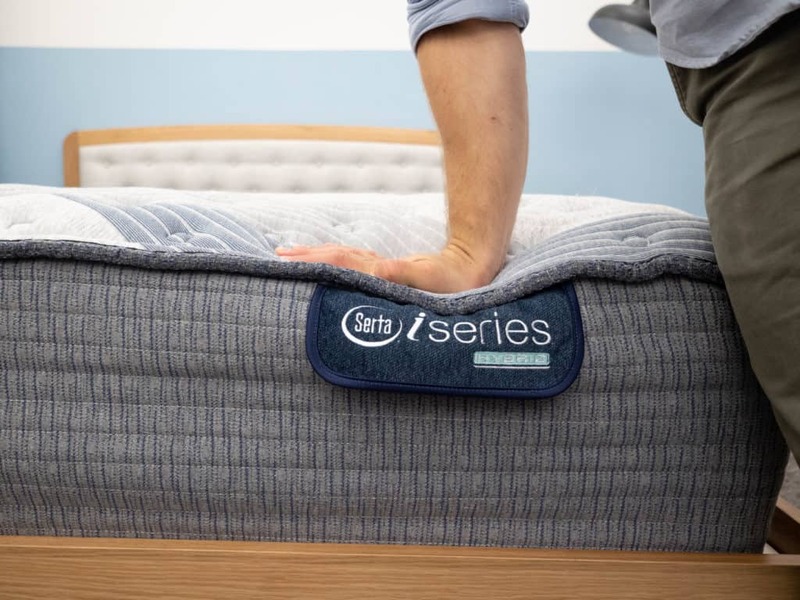 The inclusion of a soft pillow top in the 300 makes it incredibly plush, while the 500 is advertised as the line’s “firmest” bed thanks to its short quilted topper. Below, I’ll dive deeper into their individual characteristics and then compare them side-by-side. As I mentioned above, the 300 is a plush hybrid that buffers the bounce of its pocketed coil system with nearly 5” of super soft foams up top. This creates an interesting balance between pressure relief and support, which should satisfy a wide range of sleepers. Cover – The 300 and 500 have the same cover, which is crafted out of a soft blend of cotton and polyester. It’s also tufted, so it won’t bunch up as you move around the bed. 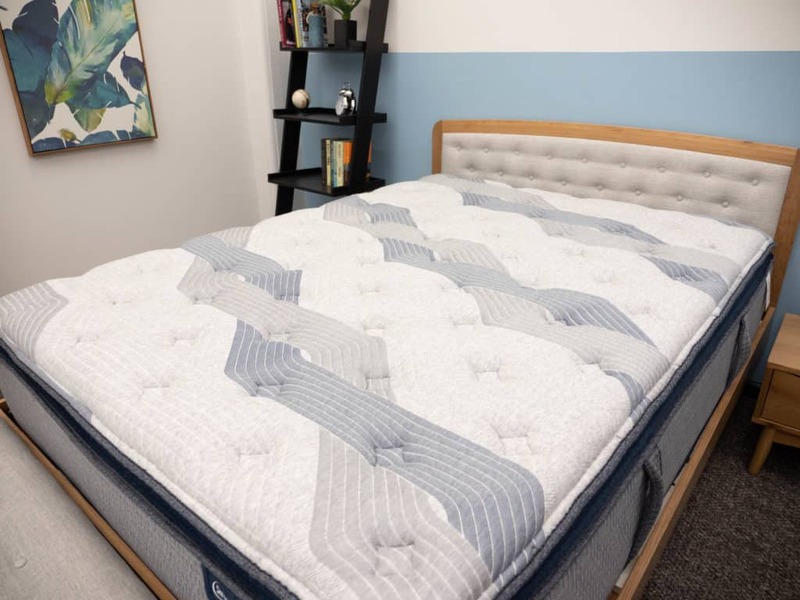 Quilting – One of the main differences between the two Blue Fusion mattresses is found here in the 300’s plush pillow top, built with nearly two inches of the brand’s PIllow Soft Foam. The inclusion of this section makes for an immediately gentle structure that’ll cushion the sleeper as they sink into the bed. 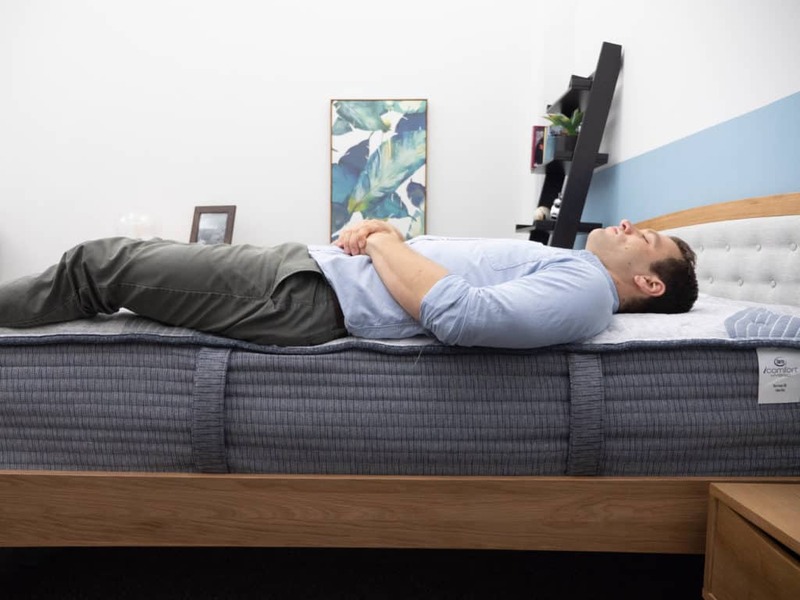 Comfort – Up next you’ll find the comfort section of the mattress, which is made up of 2.75” of Gel Memory Foam (divided into two layers) and 1” of Gel Foam. These materials work in tandem to produce deep body contouring, which allows the sleeper to sink in for some satisfying pressure relief. Additionally, the proliferation of gel in these sections help to dissipate body heat to regulate temperatures through the night. Support – Lastly, we find the pocketed coil system, which provides the mattress with support, stability, and shape. While these coils evoke a classic innerspring feel, they differ in that they’re individually wrapped, an important feature for not only encouraging airflow throughout the structure, but also for helping to control motion transfer. If the 300’s been specifically designed with softness in mind, its Blue Fusion sibling has been engineered to do the opposite. While there’s still gentle foam at play here, there’s way less of the stuff, which makes for an overall firmer mattress. 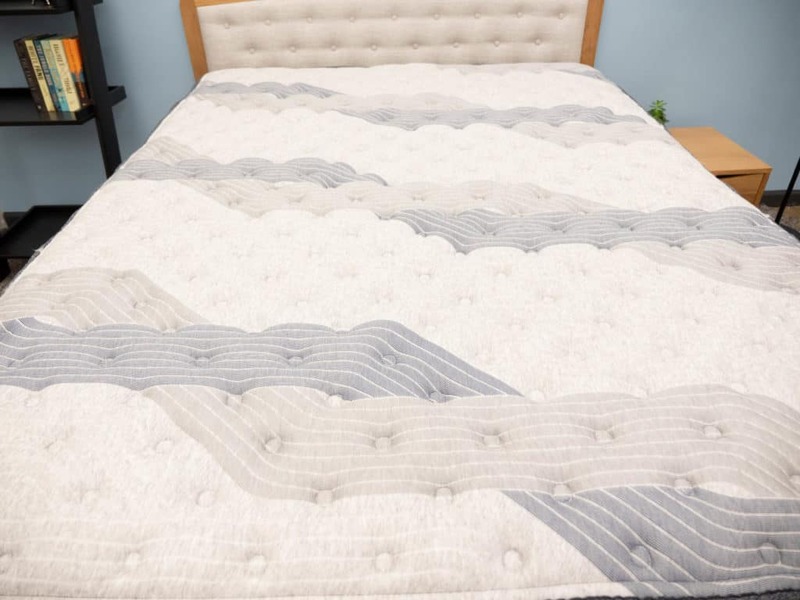 Quilting – As in the 300, the 500 features a quilted layer to provide some immediate comfort to the sleeper, though the section here (.5” of the brand’s Support Foam) is much thinner. 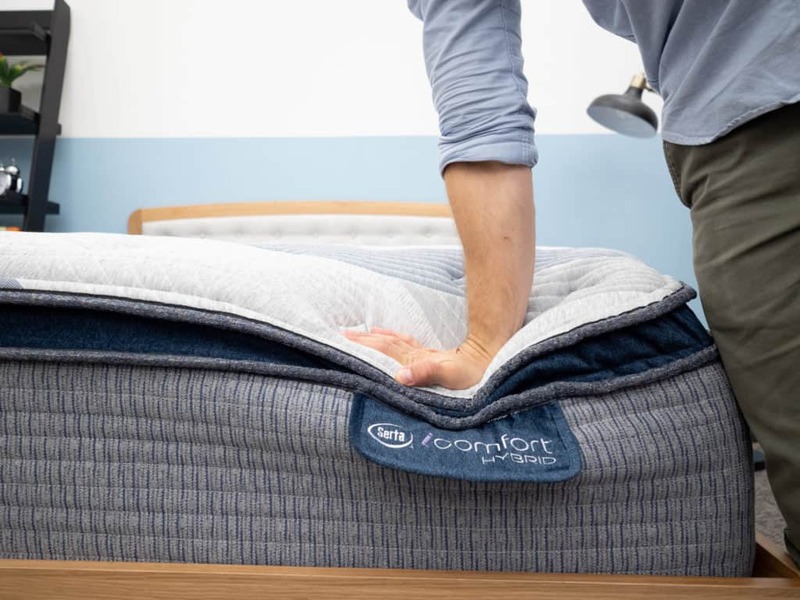 Comfort – Directly below the quilted cover, you’ll encounter the comfort section composed of three foam layers: .75” of Gel Memory Foam, 1.5” of Memory Foam, and 1” of Support Foam. The combination of materials creates a pleasant, balanced feel that should provide the sleeper with some quality pressure relief as they sink through the gentle layers. And while memory foam has a bit of a reputation for overheating, the gel infusion in the top layer helps to mitigate this issue and keep things cool. 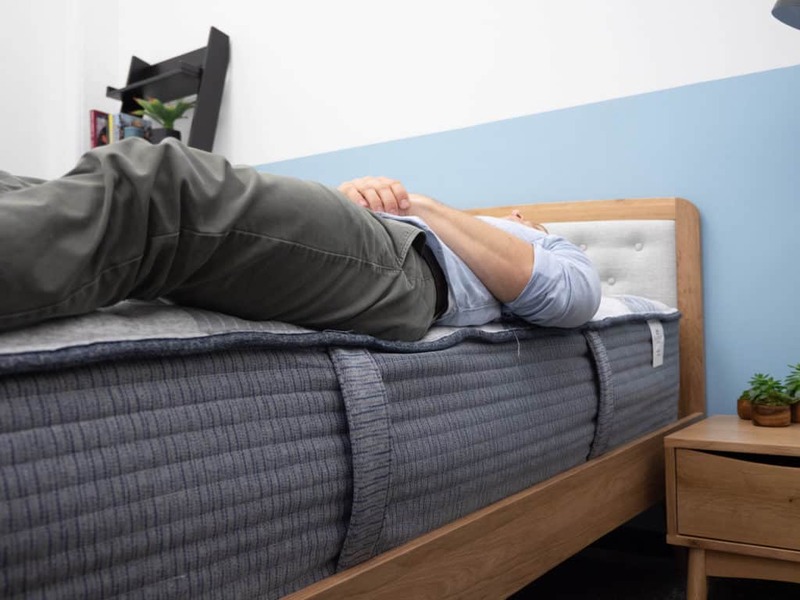 Support – And finally, you’ll arrive at the main support system of the mattress, comprised of a series of individually wrapped pocketed coils surrounded by a layer of high-density poly foam edge support. This is the same system we saw in the 300, and imbues the structure with a buoyant lift intended to keep the sleeper positioned on top of the bed. While both the 300 and 500 feature hybrid designs that mingle diverse foam materials with pocketed coils, their actual constructions are quite different and contribute to two totally unique vibes. The most noticeable divergence between these mattresses comes in the form of the 300’s plush pillow top, which makes it a much cushier bed than the 500. Though we’ll explore this in more depth later on, just know that this difference will cause the 300 to have more sinkage, less firmness, and lower motion transfer than the 500 Extra Firm. As far as price is concerned, there’s not much variation here, though a Queen size 300 ($1,400) does cost approximately $100 less than a Queen 500. After taking a look at the construction of the Blue Fusion beds, let’s chat about their different firmness levels and feels. Pressing my hand into the 300, I found that I was mostly interacting with the plush pillow top layer. My hand sank easily into this section and I could feel the various foam materials contouring to its pressure. As I pushed in further, I got a taste of just how far into the mattress you’re likely to sink. Hint: It’s a lot. Unlike with the 300, the biggest takeaway from pressing into the 500 Extra Firm is how bouncy it is. As I pushed in, I could feel the bed pushing back, an indicator to me that you’re likely to feel as though you’re sleeping “on” the mattress as opposed to “in” it. 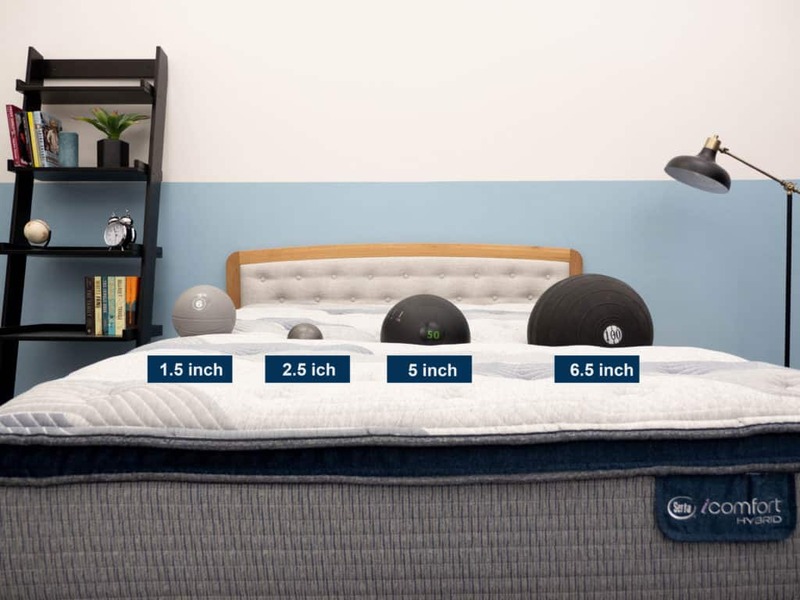 Since folks of diverse sizes and shapes are going to feel firmness differently, I decided to enlist three other testers to come in and help me figure out how firm these Beautyrest beds are. To do this, we each took a turn lying on the mattresses, and gave them personal firmness ratings, which we then compiled on the graph below. While feel is always going to be an individual thing, our responses should give you a good idea of the firmness range you can expect from these beds. 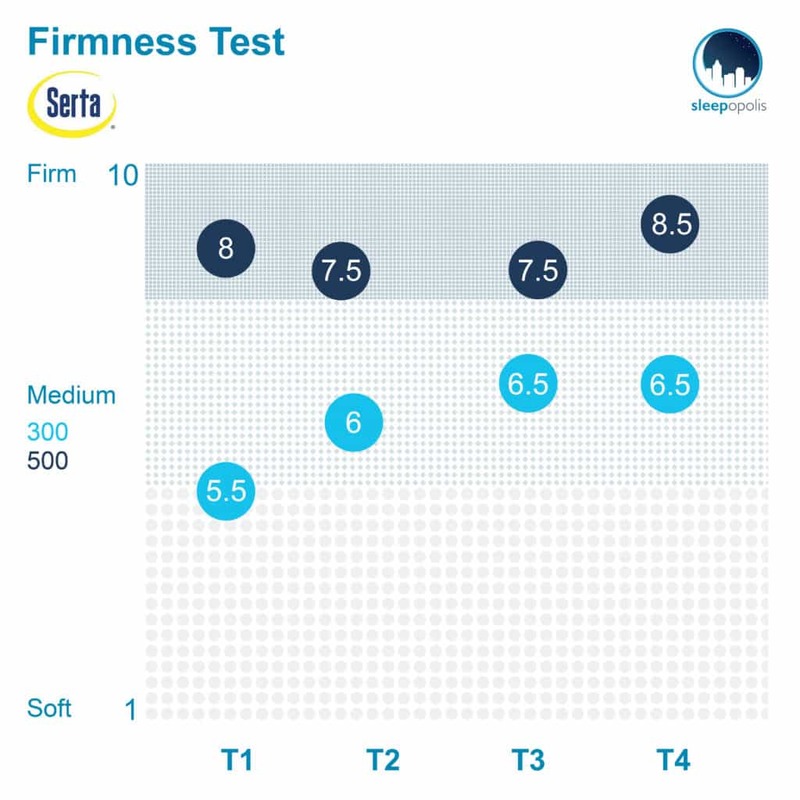 Though there was a bit of variance among my testers, we ended up landing on an average firmness rating of 6.1. When compared to the industry standard of 6.5 for medium firmness, it’s clear that this bed is a touch on the softer side. I personally gave the bed a 5.5 as I found its foam top layers to produce an extremely gentle vibe, noticeable for its intense body contouring and deep sinkage. 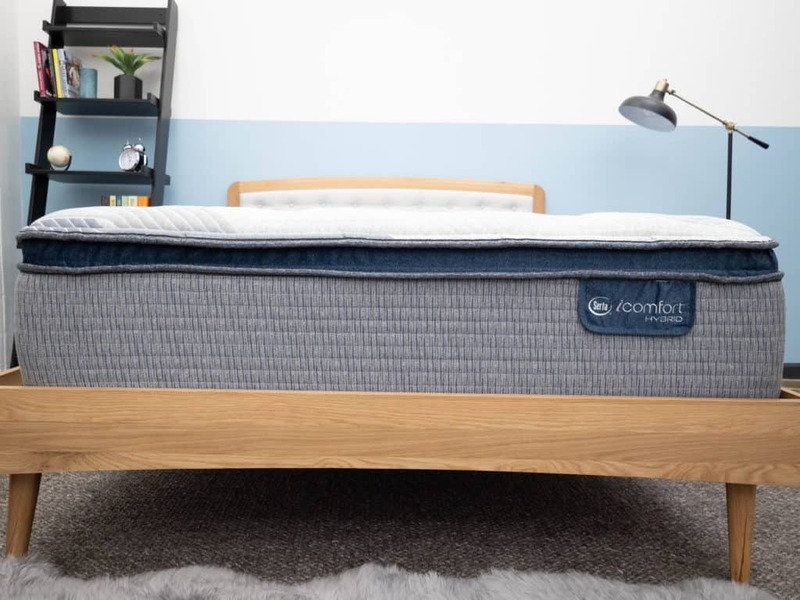 While you do get some nice support from the pocketed coil system in the mattress’ foundation, it’s not nearly buoyant enough to counteract the bed’s pressure-relieving plushness. 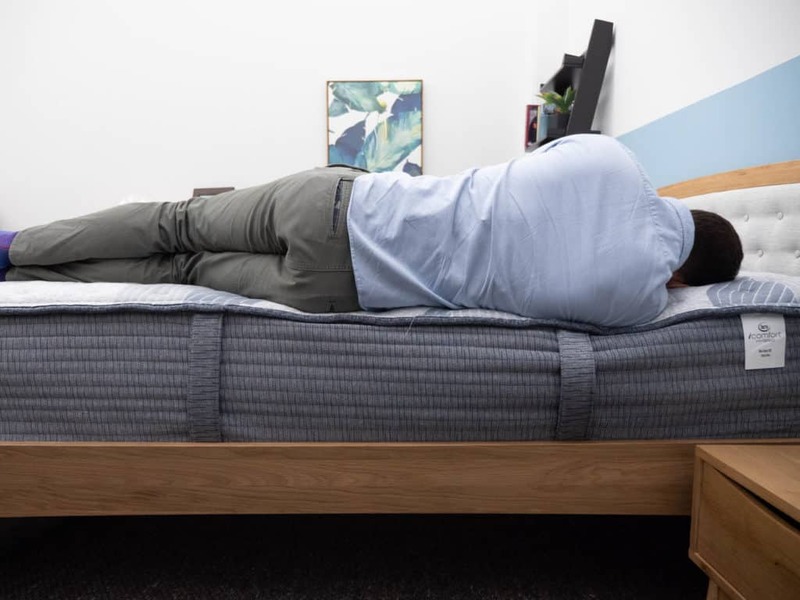 We yet again saw some discrepancy in our responses to the 500 (which I’ll attribute to the different ways in which people react to memory foam), but we ended up giving the mattress an average rating of 7.9. The bed got an 8 from me, one of the highest scores I’ve ever given a mattress (and I’ve reviewed several). Though you do get some sinkage from the foam layers up top, this bed is all about the pocketed coils, which lift the sleeper up and out of the structure. This firmness won’t satisfy everyone, but could be especially good for stomach sleepers who will find a lot to love in the spine-aligning tautness. Keep in mind that if neither of these feels… um, feels quite right, you can always check out the other models in the iComfort line, which range from super soft to extra firm. Another important component of a bed’s feel is pressure, or more specifically where pressure points are likely to form while lying upon it. To help you visualize where these tension spots might crop up, I placed a pressure map on top of the mattress and lied on my back, side, and stomach. You can see the results on the image below where pressure is represented from blue (low pressure) to red (high pressure). Back – Lying on my back, I could feel myself really sinking into the 300 as the gentle foam top layers contoured to the curves of my body. While this provided me with some satisfying pressure relief, it did leave me feeling more “in” the bed than “on top” of it. Edge Support – Moving toward the side, I felt about as secure as I did in the center. Though I compressed through the soft pillow top layer, the pocketed coils and high-density poly foam edge support prevented me from collapsing through the structure. Side – Strict side sleepers typically prefer softer mattresses that provide targeted relief to the shoulders and hips, so I experienced a lot of comfort when I turned onto my side. Again, the 300 is about a 5.5/10 on the firmness scale, which means it should provide plenty of sinkage and contouring to sensitive spots along the body. Stomach – Unfortunately, this comfort didn’t carry over when I turned onto my stomach. Unlike side sleepers, stomach sleepers need to feel buoyed on top of the structure so their hips and shoulders are in line with one another. On the 300, I could feel my hips sinking out of this alignment, which caused some discomfort. Back – Stretching out on my back, I felt squarely positioned on top of the bed. Though I experienced a little bit of sinkage as the quilted Support Foam filled in the space at my lumbar region, I was struck by just how supported I felt. That being said, it was incredibly easy to move around and change positions. Edge Support – Scooting as close to the edge of the bed as I could, I continued to feel great support. 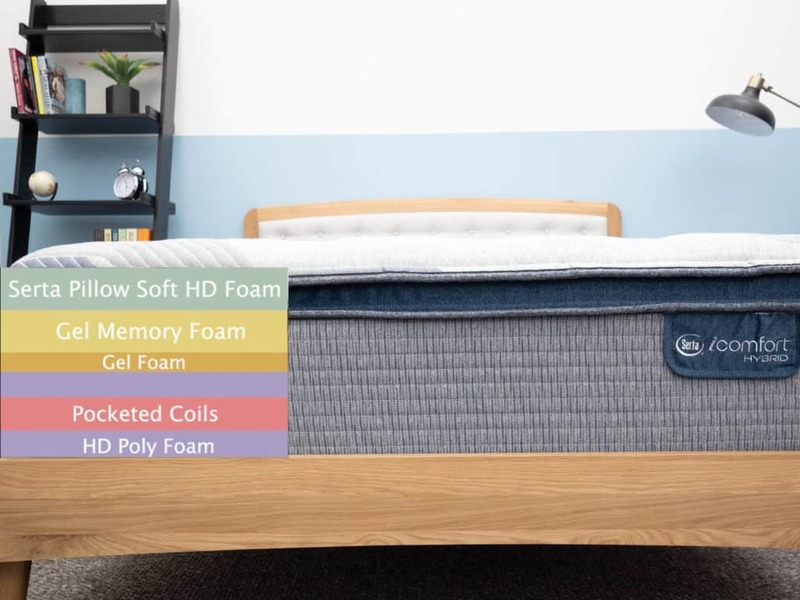 The additional layer of high-density poly foam edge support wrapped around the pocketed coil system helps to bolster the stability of the structure, ensuring that you’ll be able to use the entire surface area of the bed. Side – As we discussed with the 300, side sleepers tend to go for softer structures as they provide cushiony support to the shoulders and hips. 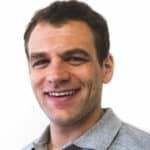 The 500 is extremely firm, so I’d say that strict side sleepers may want to check out other options in the iComfort line because they’re not likely to get the pressure relief they need from this model. Stomach – Since stomach sleepers usually shy away from soft beds that cause their hips to sink out of alignment with their shoulders, I think these dreamers would be particularly pleased with the 500 Extra Firm. I felt super comfortable in this position, with the firm support working to keep my spine in a nice, even line. 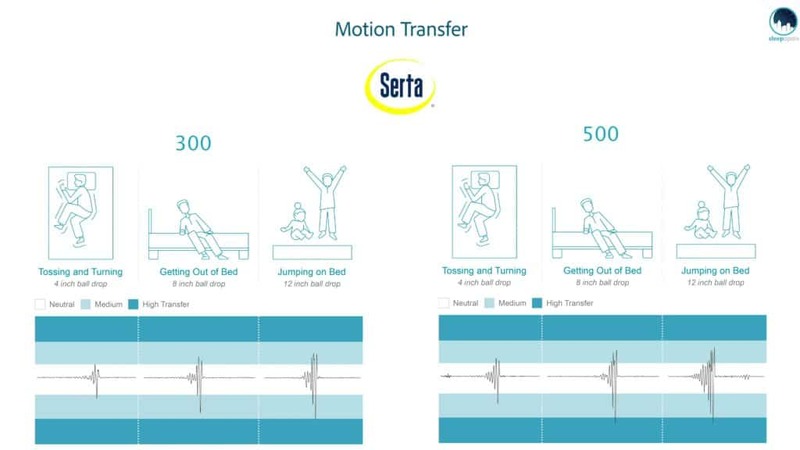 Next up, let’s chat about motion transfer, or the amount of disturbance that’s detectable from one side of the bed to the other. While this test is going to be important for all sleepers, those who doze with a partner may find it particularly interesting as it’ll illuminate just how bothered you’ll be by your bed mate’s nighttime movements. 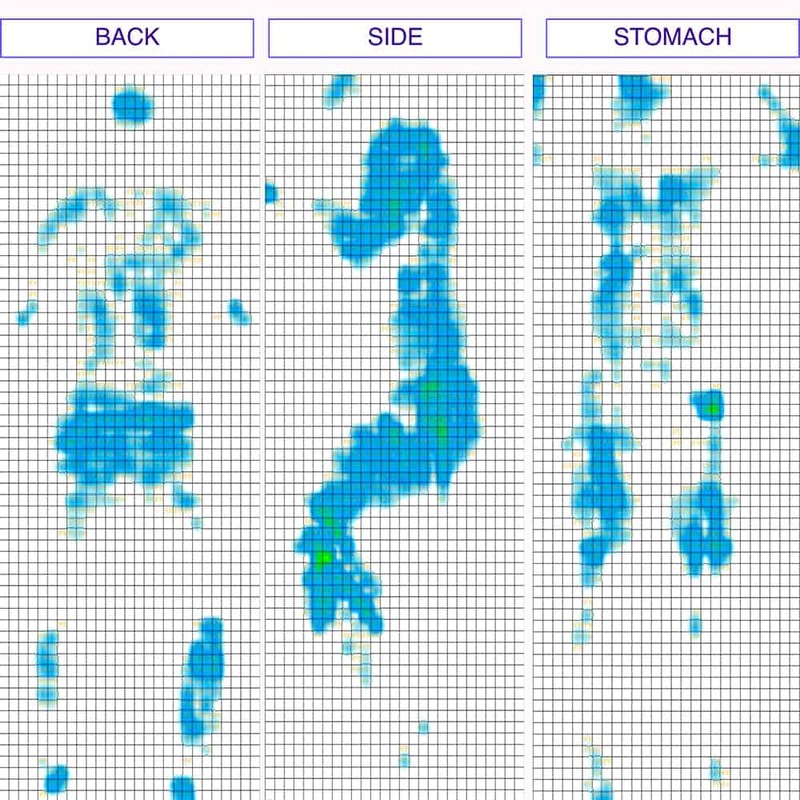 FYI: Each drop is meant to symbolize a different movement you’re likely to experience in bed, from tossing and turning (4”) to getting out of bed (8”) all the way to full on jumping (12”). These are pretty solid results! The thick pillow top layer is the real star here as the soft foams help to dampen motion across the surface of the bed. Given that there’s not a ton of bounce to this mattress, it makes sense that there wouldn’t be too much disturbance transferred from one side of the bed to the other. I’d say these are fairly average results. The 500’s bouncier than the 300, so it’s not quite as capable of containing and absorbing motion. That being said, while you’re more likely to feel your partner’s movements on this mattress than the 300, it shouldn’t be so dramatic as to seriously ruin your slumber. When buying a new bed, most people want to know whether they’ll feel like they’re sinking “into” the mattress or laying “on top” of it. 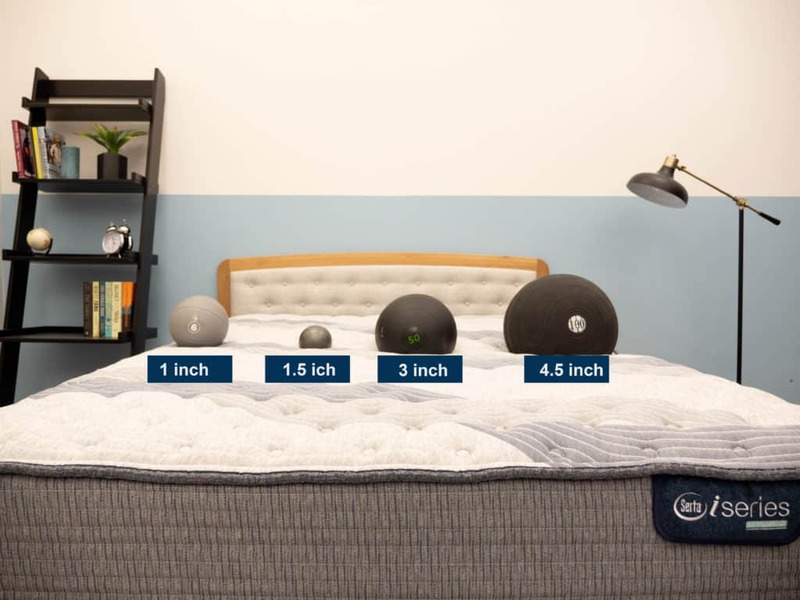 To visualize this sinkage, I placed four balls of varying sizes and densities (a 6 lb medicine ball, a 10 lb steel ball, a 50 lb medicine ball, and a 100 lb medicine ball) on the mattress and measured how much they compressed the surface. 50 lb medicine ball: 5 inches of sinkage. 100 lb medicine ball: 6.5 inches of sinkage. 6 lb medicine ball: 1 inches of sinkage. 10 lb steel ball: 1.5 inches of sinkage. 50 lb medicine ball: 3 inches of sinkage. 100 lb medicine ball: 4.5 inches of sinkage. Though these results are in line with what I was expecting, I’m still struck by their extremity. What these numbers tell me is that you’re likely to sink deeply into the 300 for some intense pressure relief, but that you’ll probably feel somewhat stuck in the bed because of it. Conversely, you’re not likely to experience very much sinkage into the 500 at all, with the firm pocketed coils placing you more on top of the structure than in it. Keep in mind that the 500 is designed to be the firmest iComfort Hybrid model, so if you need something a bit more plush but don’t want to go all the way for the 300, you shouldn’t have a problem finding a nice middle ground between the two. Shipping: Sears offers free shipping on all mattresses over $599. If you’re convinced a Helix is the right mattress for you, the size and pricing information for the mattress are below. Please note that these prices reflect standard pricing, but coupons are often available. ARE THE iCOMFORT HYBRID MATTRESSES RIGHT FOR YOU? Both of these beds benefit from the layers of high-density poly foam edge support in their pocketed coil layers, which maximizes their respective surface areas. Another thing I like about these Blue Fusion mattresses is their classic innerspring feel, a big plus for anyone in search of a more traditional, supportive vibe. As far as the 300 itself is concerned, I’d say it could make a great pick for side sleepers, thanks to its pressure-relieving top foam layers. Conversely, the 500 would likely be best suited for stomach sleepers who could find a lot to love in its supportive firmness. 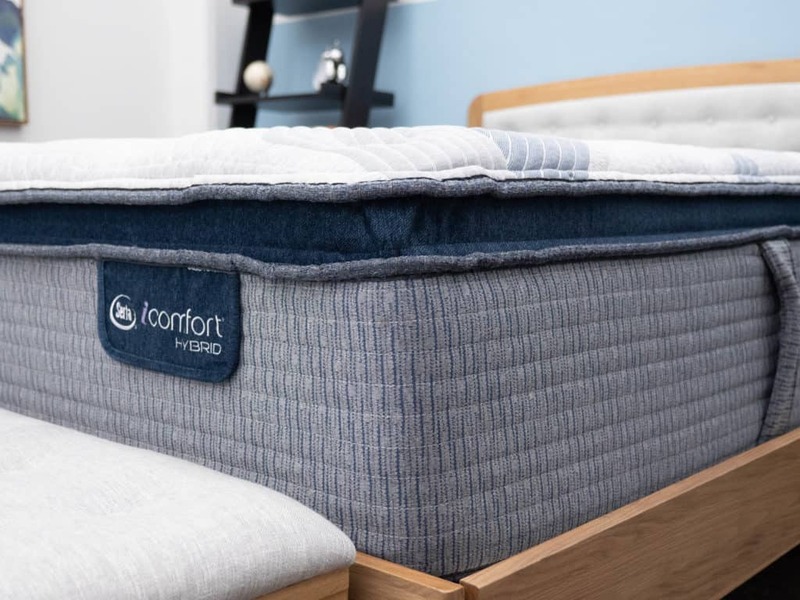 For more information on the iComfort line, check it out the 300 and 500 over at Sears!